With a ceremony held at the conference room of City hall in Skopje, the Commission for protection of the right for free access to public information has marked the 10th anniversary of its establishment and the International Day for free access to public information, which around the world is celebrated under the slogan “You have the right to know”. On the event the first speaker was the President of the Commission, Mr. Gjorgi Slamkov, PhD., who reflected on the Commissions’ mission, past accomplishments and future challenges, stressing that the free access to public information is an important tool on the road to achieving full transparency and openness of the institutions towards the citizens. The right to free access to public information in our country is founded and guaranteed by the Constitution, article 16, paragraph 3 – “It guarantees free access to public information, freedom to receive and impart information,” said mr. Slamkov, PhD. “in regards to the implementation of the constitutional provision, but also for harmonization of Macedonian legislation with EU, the Assembly of the Republic of Macedonia on 1 February 2006 passed the Law on Free Access to Public Information and its implementation began the same year on 1st of September. With the implementation of the law emerged the legal basis for the creation of a specialized body for the protection and realization of the right to free access to public information, i.e. the Commission for Protection of the Right to Free Access to Public Information “, said among other things Mr. Slamkov, PhD. “We must not be satisfied with what has already been achieved. 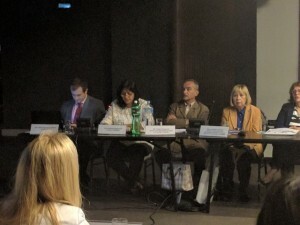 On the contrary, despite the real need for personnel and material reinforcement, we need to continue to strengthen the position of the Commission in the system which will contribute towards successful implementation of our mission to protect and provide the constitutionally guaranteed right to free access to public information “, were the last words of Mr. Slamkov, PhD. Congratulating the anniversary to the Commission, the President of the Assembly, Mr. Trajko Veljanoski underlined that “the right to free access to public information today is one of the pillars of democracy and at the same time an important tool with which public can perform social control over government. Our strategic goal is membership in NATO and the EU, our achievement of these strategic goals imposes efficient implementation of the free access to public information as one of the key criteria for full membership”. “The increase in the number of citizens as individuals who filed complaints of violations of their right to free access to public information,” according to Mr. Veljanoski speak of increased awareness, but at the same time that the Commission is recognized in society. “Equally important is that in the ten years you have managed to overcome a vast of institutional barriers. I also want to emphasize your training with information holders and officers who are authorized to provide public information as well as the officials of the institutions thus influencing and changing their bureaucratic sense “- said Mr.Veljanovski. Mr.Veljanovski appealed to all institutions to consistently respect their obligations when the free access to public information is in concern. 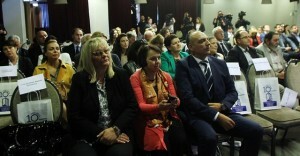 Vice – Minister of Justice Ms. Biljana Brishkoska – Boskovski said it was necessary to pay more attention to the classification of information and the delivery of the answers of the applicants. “This is especially due to the fact that EU Commission recommendations for urgent reforms in regard to the media and all requesters, as applicant to this right need to be overcomed in the provision of public information, as well as, as stated, unjustified and excessive classification of documents which are not of such a nature” added the deputy Minister of Justice. The second obstacle for access to public information, according Ms. Brishkoska- Boskovski is responding to applicant’s requests. Hence she expressed that the Ministry of Justice is ready to take actionss in regards to the clarification of these issues in the Law on Free Access to Public Information, said the Deputy Minister. 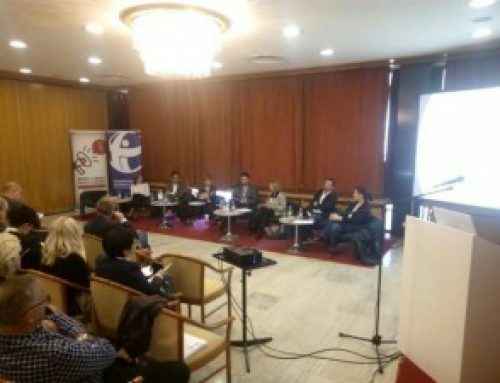 Speakers on this event were Ambassador Nina Suomalainen, head of the OSCE Mission to Skopje, Louisa Vinton, UN Resident Coordinator and UNDP Resident Representative, and Jaromir Levicek, the EU Delegation in Skopje. They underlined the need for greater transparency of the institutions and their functioning according to the principle of public and proactive disclosure of the data, extending the Open Government Partnership project, as well as comments regarding the public information noted in the European Commission Report Commissions’ President Mr. Gjorgi Slamkov, PhD., Ambassador Nina Suomalainen, head of the OSCE Mission to Skopje and Louisa Vinton, UN Resident Coordinator and UNDP Resident Representative, on the end of the event the Commission signed MoU’s with the OSCE Mission, and with UNDP.